Yu Aoi Film Discussion – Honokaa Boy | personal.amy-wong.com - A Blog by Amy Wong. Honokaa Boy tells the story of a boy – Okay, a young man – who ends up living in the small Hawaiian city of Honokaa, after he mysteriously falls in love with the place during a failed trip with his girlfriend. In there, he meets a bunch of quirky people that are very likable, who end up having an impact on his life. In Honokaa Boy, Masaki Okada plays Leo, a young man having relationship trouble. His relationship with his girlfriend, briefly (literally) played by Yu Aoi doesn’t work, and Leo ends up living in the island meeting a bunch of people. One of the persons he meets is an old woman who lives alone – a widow for the past 50 years, and is a great cook. One day, he leaves a bag of flour at her place, and she suddenly invites him back for a home-cooked meal, which he couldn’t possibly resist since he is living off instant noodles. After that incident, a friendship starts. 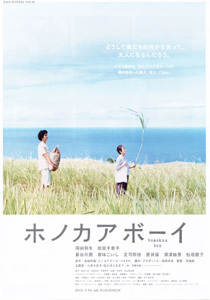 The pacing of the film is slow, as it is in many Japanese films, and it has a simple premise. Most of the weight falls onto the characters themselves. Leo is a perfectly charismatic guy, while Bee-san (Chieko Baisho) plays a perfect counterpart – Keiko Matsuzaka was also great – but what made the film is the platonic relationship between Leo and Bee-san who are ages apart in years. Bee-san even tries to make herself pretty with a trip to the beauty shop, and a brand new bright-colored dress. However, as any relationship must suffer, theirs is threaten by Mariah (Jun Hasegawa), a young woman working at a local store. Leo seems interested in her, and why shouldn’t he? She’s attractive, he’s attractive. They’re both young. I mean, except for Yu-chan. Gosh! Talk about a blink — for too long — and miss it role. She’s literally in the film for about 5min. before she’s gone forever. The most I remember about her character was the bit where she’s sitting and Bee-san (that was Chieko Baisho, right?) drops liquid on top of her head. Overall, Honokaa Boy has some great moments, though.